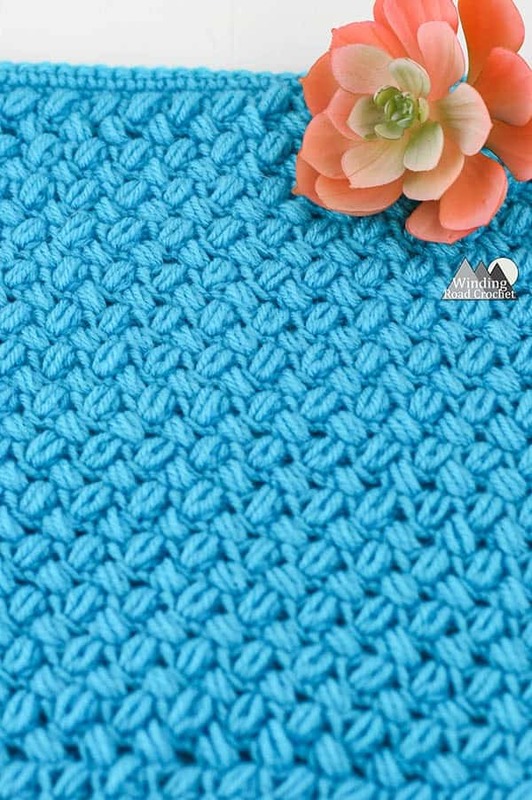 The bean stitch has a beautiful texture similar to the puff stitch, except in sits at an angle and interlocks with the other rows creating a denser and more solid swatch. Below you will find both a video to walk you through this stitch. I think you will find it an easy stitch to master. If you like this stitch, Pin it for later! This stitch is one of the stitches included in the March Texture Madness Crochet A Long. You will be able to find 3 different size sample patterns below. These can be used in my Crochet Sensory Baby Book Pattern, Crochet Sensory Baby Block and one other pattern included in the Crochet A Long. If you are a fan of crochet, check out some of my free crochet patterns. Gauge is determined by using the Bean Stitch. Bean Stitch – *Insert hook into the next stitch, Yarn over and pull up a loop, Yarn Over* repeat from *to* for a total of 3 times. You will have a total of 7 loops on the hook when done. Pull the first loop on the hook through all other loops on the hook. You will work a Chain 1 after working a Bean St to close and secure the bean stitch. When working Bean Stitch you will want to Chain a multiple of 2 for your starting chain. Large 12 inch Swatch we will chain 38. Medium 8 inch Swatch we will chain 24. Small 4 inch swatch we will chain 12. Ch 12, 24, or 38 depending on the size swatch you are making. R1: Sc in the 2nd Ch from the hook and every Ch across. R2: Ch2, turn, Hdc in the first St, Skst, *Bean St, Ch1, Skst* repeat from *to* until you reach the last St. Hdc in the last St.
To continue repeat Row 2 until your project is as long as you want it. When working you bean stitch in Row 3 and beyond you will be working your bean stitch into the Ch1 space. If you take your work and stretch it out a bit horizontally you will see a small triangle created by the Chain 1 space. Work your next stitch into that triangle. Watch the video tutorial to get a better look at where to work your Bean Stitch. For the 12 inch square work until you have a total of 33 rows. To make a 8 inch square work until you have a total of 21 rows. For the 4 inch square work until you have a total of 11 rows. Ch1, working down the side of the rows, *Work 2 Sc in the side of the next Hdc, work 1 Sc in the side of the next HDc row* repeat from *to* until you reach the corner, Ch1, turn at the corner, Sc in the bottom of each St across, Ch1, turn at the corner, *Work 2 Sc in the side of the next Hdc, work 1 Sc in the side of the next HDc row* repeat from *to* until you reach the corner, Ch1 , turn at the corner, Sc in the top of each St. Ch1 slip stitch to the first Sc of the border row. Written pattern, tutorials, graphs and pdfs for the Bean stitch tutorial are copyright Windingroadcrochet.com. Please do not reprint or repost this content as your own, but please feel free to share this link with others. You can find more information on sharing my work with others in the Terms and Conditions Page. Love your textured crochet ideas but I’m into Tunisian crochet and would love ideas using that technique for a sensory blanket.